This is really great app that helps kids to practice their writing skills. It is also a very good classroom tool and teachers will find it to be a fantastic addition to their lessons. We have given the app an EAS Certification of 5 Stars and EAS Recommended Status. Teachers and parents often ask us for apps that help kids to practice their sentence structure, word order, spelling of words and the development of general self-confidence in their own writing. This app fulfils all of these requests. 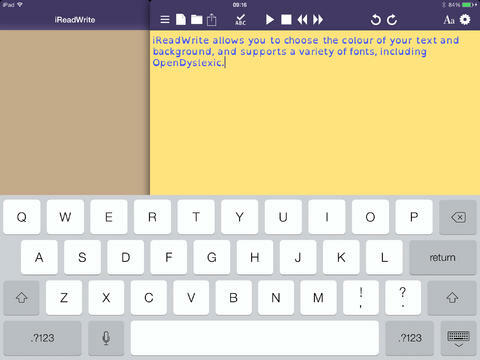 iReadWrite is great for children of all ages at a Primary or early Secondary level. Due to features within the app, it is particularly helpful in supporting struggling readers and writers, those with dyslexia and dysgraphia or with other learning difficulties. The reason why this app is so powerful lies in the mechanics of how the app works and responds to writing. The learner will write up their sentences and once complete, a voice within the app reads what has been written. This is what is called the “Text to Speech” feature in the app. By being forced to listen to the voice that reads back what the learner has written, the user can listen closely to the words and spot mistakes. The word prediction feature suggests words whilst you write to help you complete a sentence and also, users can spell-check their own work and find alternatives of their own spelling to choose from on the left-hand side of the screen. Self-correction is one of the most powerful ways in which to learn and this app pulls this off in buckets and spades! We like that the app is very easy to use and engage with. The texts can be highlighted and manipulated on the screen. You can copy and paste text into the screen. All work can be saved and shared with peers, parents or teachers via the email option. Moreover, the app works online as well as offline! We know that many schools have problems with their wifi speeds, so you can be guaranteed that with this app, the wifi will not disrupt the flow of your class. Equally, if you are a parent with your child and they are using the app whilst out and about, you can switch-off the 3G and rest assured that your child is only navigating iReadWrite. This is a fantastic app. It’s more expensive than other educational apps however; this app has amazing technology and is of very good quality. Children will really score high on learning outcomes with this app and we highly recommend it. 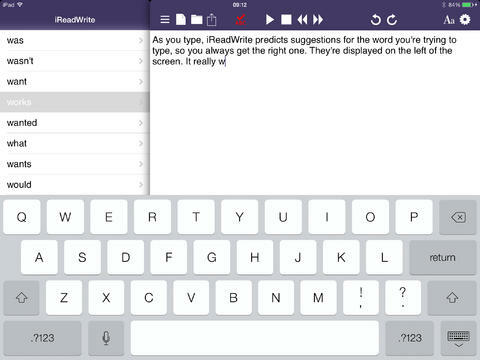 iReadWrite makes reading easier and ensures accurate writing as you use your iPad for school, work, or leisure. This easy-to-use reading and writing App runs directly on the iPad with no Wi-Fi or 3G access necessary. It includes powerful support features that benefit struggling readers and writers of all ages, especially those with dyslexia, dysgraphia, or other learning difficulties. 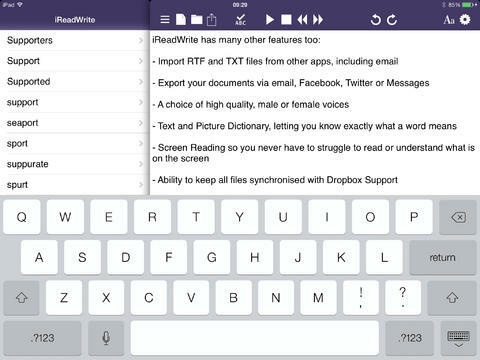 iReadWrite is an affordable all-in-one solution for anyone looking for reading and writing support as they work on their iPad! 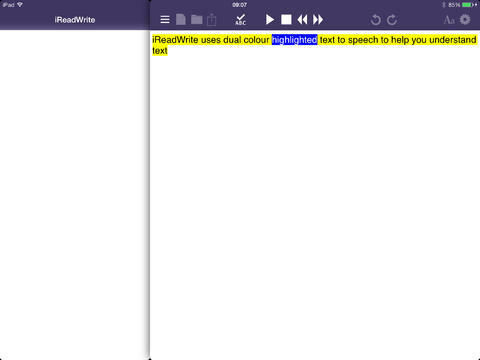 Read text aloud with dual-color highlighting. Highlighting the sentence in one color and the word being read in another color helps with focus and reading comprehension. Highlighting colors can also be customized to suit your preferences. By having your writing read aloud, you can ensure that what you wrote is what you actually meant to write! Use word prediction to complete a word being typed or suggest the next word. Suggestions are displayed on the left as a user is typing. Simply tap the word you wish to use. Word prediction uses context and the phonetic spell checker to help predict the best suggestions. Develops writing skills and helps construct sentences with ease! 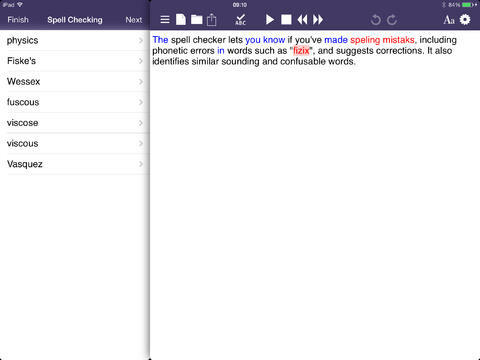 The phonetic spell checker allows you to identify and correct spelling mistakes including phonetic and flexible spelling errors (e.g. no vowels). The spell checker, which has been tuned for common dyslexic spelling errors, also uses co-location to look at the words around the error and make better suggestions. Words that sound the same as well as those that are easily confused are identified along with alternate choices and definitions to help you easily choose which word to use. Provides text definitions as well as images for selected words to help expand vocabulary and improve comprehension. Customize the background and text colors based on your needs or preferences. Choose from a variety of natural-sounding text-to-speech male and female voices and easily-readable fonts including OpenDyslexic. Speech rate for voices can be set to Slow, Medium, or Fast via the Preferences menu. RTF and TXT documents can be imported into iReadWrite from anywhere. Documents that you create can be shared via email, Facebook, Twitter, or Messages. Documents can be printed on AirPrint compatible printers via the Export Menu. Texthelp (www.texthelp.com) provides literacy software solutions for individuals, K-12, and Higher Education on the Desktop, Cloud, and iPad. Read&Write Gold works on PC or Mac with a customizable easy-to-use toolbar that integrates directly with common applications allowing users to access reading, writing, studying, and research support tools from within programs they use every day. Read&Write for Google™ is a cloud-based solution that works in Chrome on PCs, Macs, and Chromebooks to provides support tools for Google Docs, PDFs, ePubs, and more! iReadWrite for the iPad benefits struggling readers and writers of all ages with support features such as text-to-speech, word prediction, phonetic spell checker, dictionary, and picture dictionary.